With the (seemingly endless) upward spiral of digital resolution comes a fair amount of hand wringing over the future relevance of still photography as an art form. It’s currently possible to pan a scene with a digital video camera and pluck individual frames for web use. And what, the paranoid landscape photographer laments, will we do when everyone with a high-resolution digital SLR can walk up to a beautiful scene, snap a single wide frame, and in the comfort of their office (or recliner) crop many compelling smaller images for print? Relax. Regardless of the number of usable frames in a video, or printable crops from a single still-camera click, images captured without consideration of the scene’s front-to-back dimension are still just flat, two-dimensional snapshots. The snapshot world has always been the domain of tourists who simply want to save a memory (not that there’s anything wrong with that), and is rarely a productive path for truly creative photographers. Many photographers do pretty well with a more literal interpretation of the world, but struggle understanding how their camera’s view of the world differs from theirs, and how to take advantage of those differences. Foremost among these differences is the missing depth dimension. Rendering our three dimensional world in a two-dimensional medium requires a paradigm shift for photographers accustomed to capturing the world as it appears to their eyes. But while it’s impossible to create a true three-dimensional image with a standard camera, it is possible to create the illusion of depth. Creating this illusion starts with of a couple of simple principles. First, never settle for your primary subject. When when your primary subject is in the background, force yourself to seek a complementary foreground. Conversely, when your subject is in the foreground, pay special attention to the background. Your complementary subject doesn’t need to be compelling, it just needs to provide a brief stopping point on a different plane from your main subject, or a path for the eye to follow through the frame. Leading lines, like a fence, creek, or lakeshore, guide the eye through the frame. Or you can create virtual leading lines with a prominent rock, shrub, or tree that your viewers can subconsciously connect to the primary subject. In most cases, you’ll want your complementary object to connect diagonally to the primary subject. But the illusion of depth can also happen without leading lines. Simply giving your subject a foreground or background with visual interest can be enough, such as the snowy meadow beneath Half Dome in the image here. An easily overlooked flaw that can rob a scene of depth is merged visual elements on different front-to-back planes. For example, even though to your eye that distant rock is clearly behind the tree right in front of you, unless the two are completely separated horizontally (left/right, up/down), in the camera’s two-dimensional world they’ll appear at first glance to be a single object. Often the solution is as simple as moving left/right, forward/backward, or up/down. Photographing Yosemite with fresh snow, it’s easy to get so caught up in your own reaction to the beauty that you forget the camera will “see” it differently. Rather than concentrate on Half Dome above Cook’s Meadow’s snow-etched elm, I paused to better understand what made this moment feel special. At my feet stretched the meadow, normally brown and tramped by visitors, transformed by a pristine marshmallow meringue of new snow. Dropping to snow-level, I used a wide vertical composition that emphasized the foreground, allowing the undulating snow to carry the viewer’s eyes into the larger scene in the distance. The sky wasn’t particularly interesting, so I minimized its presence in the frame and gave as much real estate as possible to the snowy foreground. At f16 and 32mm, focusing on the edge of the nearest pool, about 7 feet into the frame, gave me sharpness from 3 1/2 feet to infinity. 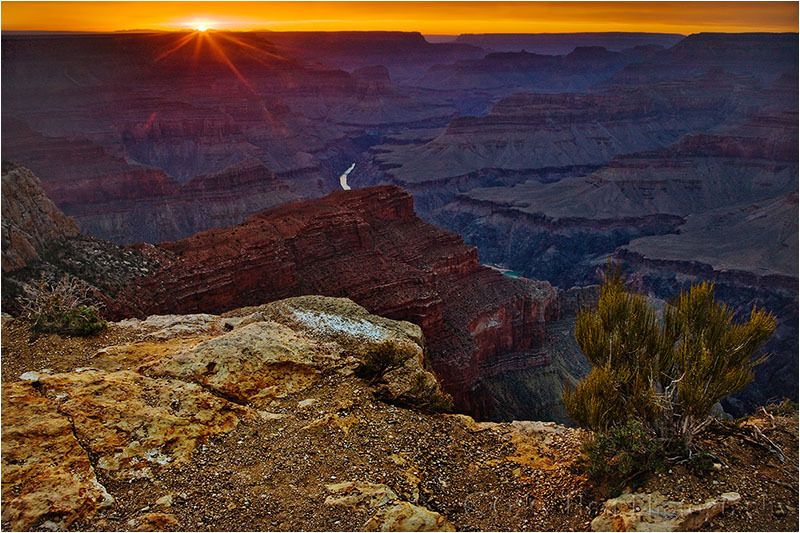 This image is all about the distant Grand Canyon and sunset. Nevertheless, I found a couple of unassuming shrubs for my foreground to create the illusion of depth. I took care to separate them far enough to allow the eye to flow easily into the canyon and beyond. And having the shrubs near the border also signals that they’re not significant subjects. My focus point was on the rim, just a little behind the right shrub. This is an important topic (especially for amateurs like me) very well presented. It would be a good subject for an article in Outdoor Photographer.